You wouldn’t know it from my cheese obsession, but I am fond of vegan cooking. Vegan cuisine also holds great interest for me, as someone interested in the culture of food. In the East, Buddhist monks developed venerable and intricate vegan cuisines, like the Shojin temple fare you can sample at Kajitsu in Manhattan, or the temple-inspired Korean dishes at Hangawi. 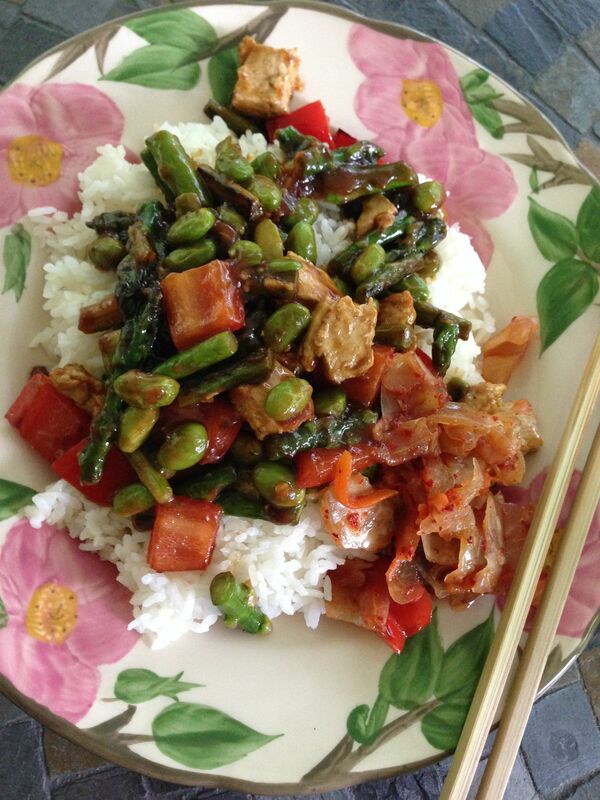 For home cooks, Asian food is easiest to veganize, because it’s not based on butter, cream, and eggs. The meat is deleted, or replaced with tofu, seitan, tempeh, or a meat analog. Stir fry with asparagus, red bell pepper, edamame, Gardein chix and kimchee. In the West, there is no equivalent, no tradition of animal-free food. Aspiring vegan foodies have had the daunting task of creating a cuisine from scratch, and of countering the assumption that plant-based food is boring, bland, and forbiddingly “healthy.” I sit on the board of an animal shelter, whose members recently groaned at the prospect of having to attend an event where all the food would be vegan. It turned out to be an exciting spread of flavorful dishes. The ones I remember most fondly were a black bean and corn salad with lime and cilantro, homemade potato chips, and a delicate, fluffy hummus with fried pita chips and veggies. This was followed by luscious frosted cupcakes that tasted as good as any non-vegan ones I’ve sampled. Vegan food has come a long way, especially with the advent of Isa Chandra Moskowitz and the Post Punk Kitchen. Isa is the author with Terry Hope Romero of Vegan Cupcakes Take Over the World and Veganomicon, two of my favorite vegan cookbooks. What makes her food different is that she designs her recipes from scratch to be vegan. She has a chef’s creativity, but also a sense of what works for home cooks. My favorite Isa recipe is also one of her most popular: chickpea cutlets. The wheat gluten powder acts as a binder and gives the cutlet mixture an amazing, springy, chewy bite that is extremely satisfying. They fry up with a crunchy, brown exterior. You can make them with any kind of bean. I used cannellini beans. For people who can’t tolerate gluten, there is a gluten-free version, but I haven’t tried it. 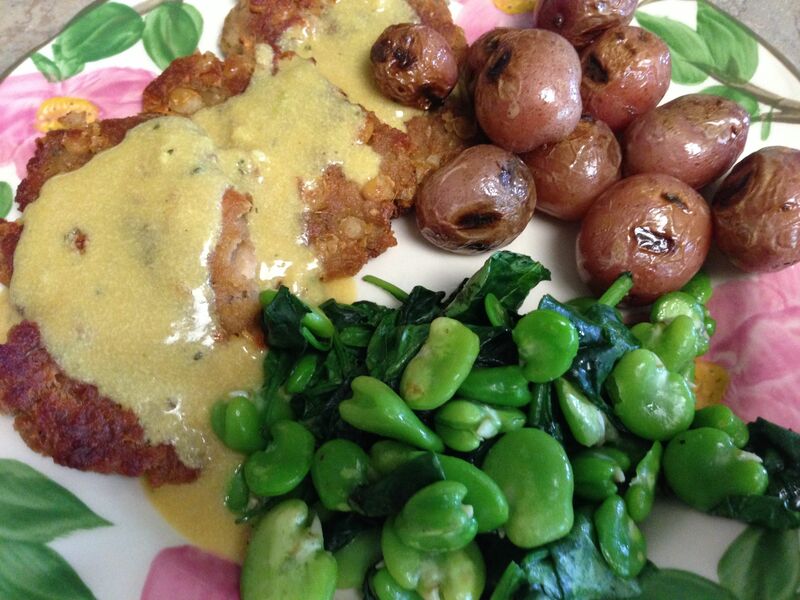 Bean cutlets with nootch, grilled baby potatoes, and fava beans with wilted spinach. Another tried-and-true recipe is affectionately termed “nootch sauce” by longtime vegans. It uses an ingredient that is less familiar to non-vegetarians, nutritional yeast. Nootch is something you develop a taste for. It has its own flavor, salty and laden with umami. It’s analogous to cheese, but doesn’t taste like cheese. I love it over my vegan cutlets! Veganomicon has great instructions for cooking tofu as well. My favorite way takes a little extra work, but it’s worth it. First you take your block of firm tofu (not silken) and press the water out of it for 20-30 minutes by putting it between paper towels and loading some heavy dinner plates on top (or a plate and a big can of something). Then slice into four triangles (or eight if you like it crispy) and marinate overnight in a cup of white wine to which you have added a couple of cloves of sliced garlic, some tamari or Bragg’s liquid aminos, the juice of half a lemon, and a nice big sprinkle of herbes de provence. When ready to cook, broil for 15 minutes on low, then turn, baste with a couple of spoonfuls of the marinade, and broil until nicely browned. For your wine sauce, reduce the marinade down by a third and thicken with a little cornstarch dissolved in 2 tbs. water. Yum. 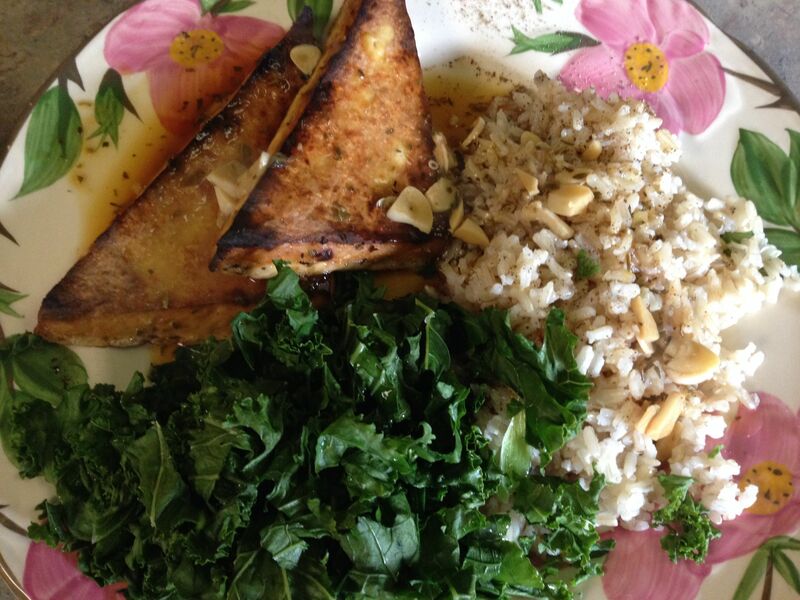 Broiled tofu with white wine sauce, brown rice, and fluffy kale (chop into ribbons and cook in the microwave for a great, light texture). I may not ever become a vegan, but my vegan meals are good for the palate, good for the body, and good for the soul. Yes, the nootch is not for everyone, but I have developed a taste for it. The tofu is easy and very good, as long as you have some kind of sauce to boost the flavor. I like the wine reduction, but I’ve used Asian sauces too. Looks so delicious, all of that! I’m a staunch omnivore, but I’d never baulk in advance at going/being made to go to a vegetarian/vegan restaurant or event. If the food is good it’s good, and if it’s bad, then the addition of meat wouldn’t have saved it, surely…? Well, I still have not managed to like brussels sprouts, but I will eat them now and then. Beer is another matter. Only the super bitter, hoppy IPA’s turn me off, and even then it’s not the bitterness so much as the over-perfumed scent of them. That all looks delicious *thecarnivoresays*. I really ought to give these recipes a try. All of them sounded reasonably easy to make and looked mouthwateringly good. My friend is vegan and someone brought these to a party. I thought, “Oh lord, well I guess I’ll eat it to be polite.” But they were actually delicious. I believe the icing makes enough for a double batch. Now I am hungry (again) after that vegan meal I just had and stuffed into the kid too :)!